What Are My Blogging Goals? For a person who thought a goal was something that only happened in soccer, it was difficult to define my blogging goals when I started to blog. I just wanted to write and for months I hadn’t been writing. The blog format seemed a perfect framework for a blocked writer: short takes and micro essays. Then Lisa Rosenbaum, author of A Day of Small Beginnings (Little Brown, 2006) started a blog called The Write Stop at http://lprosenbaum,wordpress.com In her introductory post she explained that her blog would be a place where she would go when she had to stop working on her novel, “a place to stop for a short visit before returning to what we do.” This seemed so sensible and much more ambitious than my own blog, which became the place where I go to work. Rosenbaum’s blog is like a lounge where we rest from the real work. I wanted to adopt this concept. The only problem was I wasn’t doing the real work. I had no project from which to rest, to stop working, other than my blog posts. That was my first reaction. Then I remembered that ever since February 2010 I’ve thought about writing a memoir of my bat mitzvah, something like Today I Am a Hot Flash: Celebrating Bat Mitzvah at Sixty-five. I’ve done the research, written notes and some scenes, but have not been able to commit fully, as in “My goal is to finish this book.” Last week when I searched my soul to figure out what was blocking me from committing to writing this memoir, I discovered Jeremiah. Yes, the prophet himself was ranting and raving, intimidating me into passivity. Once I defined this block, David, my partner and coach, handed me a way out. He gave me Jeremiah written by Rabbi Benyamin Lau, one of my favorite Israeli rabbis. Even though the book is in Hebrew, I started reading immediately. Each page acted like a chisel, chipping layers off my writer’s block. By page ninety I was ready to write. First I reread what I had written over the past twenty-two months. Not totally bad. Then I organized all the material – one notebook for the research, another for the writing. I want to declare that this stage of organizing the papers, filing the notes, slipping the pages into transparent nylon folders is empowering. The next day while riding the #400 bus to my day job at Bar-Ilan, I came up with a possible structure. I wrote it down frantically on the back of a flyer for ballet lessons as the bus ground to a halt, stuck in a traffic jam near Ben Gurion airport. I didn’t care where I was or when I’d get to work because I had a map of where I was going. The memoir had direction, a beginning, chapters, an end. I was flying high. Now I have a project. My goal is to finish the project. My brain is working again. It’s writing. Even as I sleep, it’s threshing the material. A kernel of an idea wakes me at 4:30 a.m. and before I even put on my slippers to walk into the living room to do a few yoga stretches before making my morning coffee and sweeping the floor reading yesterday’s paper cleaning the windows watering the plants and organizing my desk before sitting down in front of the computer to read all my emails and surf a little, I feel blessed that I have conquered my block, at least for today. Now my blog too can morph into an airport lounge, that liminal space between home and take-off where we cajole our faint courage to fly. This entry was posted in Not writing, The Writing Life, Writing goals and tagged bat mitzvah at sixty-five, blogging goals, Lisa Rosenbaum, writer's block. Bookmark the permalink. 8 Responses to What Are My Blogging Goals? More power to you, Judy, for returning with renewed vigor to your big project. You’ve made me want to step back from my own blog and reconsider my goals, especially since many of the hits are from people seeking information about a certain brothel in Nevada, which I merely mentioned in passing. Amazing how the mention of one brothel in Nevada can turn you into a famous blogger. Maybe I’ll try it sometime – the mention, that is. I just wanted to cheer you on! Go, Judy! Go, Judy! Give me a J! Give me a U! Give me a D! Give me a Y! What does it spell?! JUDY!!! WOOHOO!!! In all seriousness, though, I am so thrilled to read that you’ve found a way past your block. The best way to keep it away is to keep going, no matter what! And if any nasty voices pop up and start telling you that you’re not good enough, or the writing’s not good enough, tell them to go to hell. 🙂 And keep writing anyway. Woh Judy, Yermiyahu Hanavi as a writing coach! That’s pretty heavy stuff! I’m impressed. Looking forward to the memoir. Don’t hot flashes stop at 65? Yermiyahu Hanavi as the BLOCK to writing. Yes, it’s rare that hot flashes continue so long. Another wonderful post! But my burning question is: what did the Benjamin Lau book say that got you to chipping away layers of writer’s block?? I’d love to hear about that! (The prophet as the block to writing?) Love the photo too. Lau puts Jeremiah in his historical context which is fascinating. He “re-edits” the book of Jeremiah in order to do this. Lau’s approach and his voice enabled me to feel like I didn’t have to be a biblical expert to dare to write something about the prophet in my memoir. The block had more to do with my own standards which are too high and self-defeating. Meanwhile, a few other block have emerged, as in *There’s never a vacuum*. So glad you appreciated the photo, Joan. 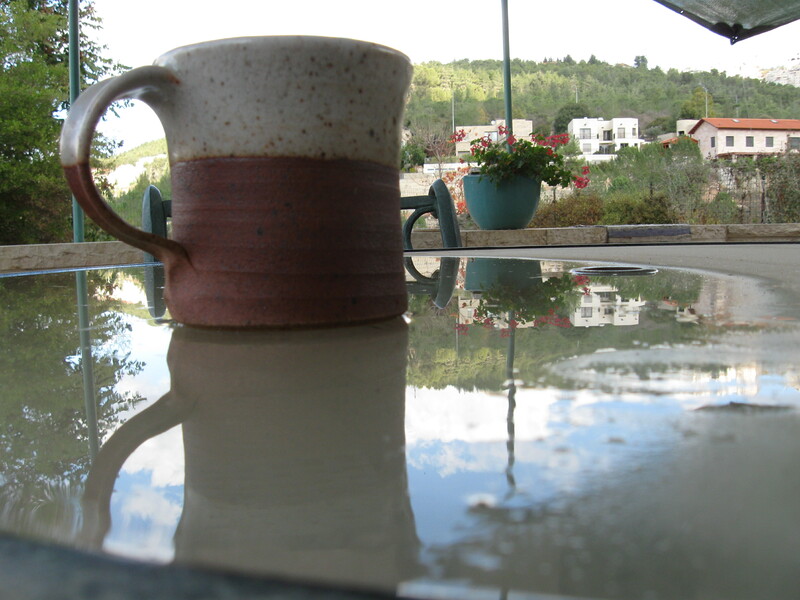 The contrast between home and take-off was so visible right there on the porch table after a rain had left a puddle on the table and I could see the sky reflected next to the coffee mug and the other homes in the background. I’m inspired to learn how to shoot close-ups by the wonderful photos and graphics on TV Channel One in Israel. Soon you’ll see what I mean. Now I have another goal: to learn how to set the close-up and light functions on my camera. So much to learn . . .